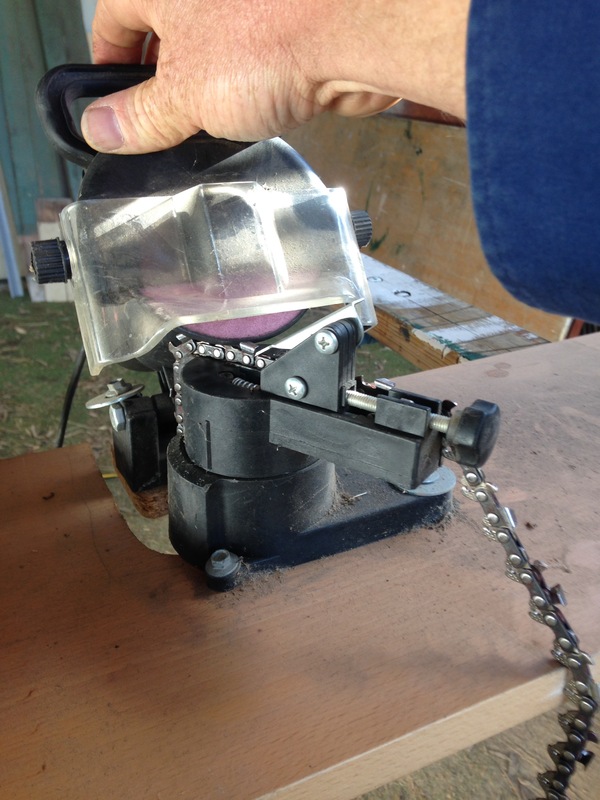 There are many ways to sharpen a chain. I persisted with a file for a few years, before discovering the talents of a local expert in Gundaroo Machinery Services. Andrew sharpened my chains for many years and does a great job, but I wanted to see if I could sharpen the chains myself, so I bought a cheap sharpening disc off eBay. It took me a couple of goes to get it set up how I liked. I ended up bolting the sharpener to an old particle board shelf. AI then cut a slot for the chain to be fed around the sharpener. When it comes time to sharpen my chains, I simply place the shelf across two saw horses. This means I can loop all my chains over the shelf and then do them in a batch. I found the sharpener instructions easy to follow. The disc is designed to sharpen each tooth’s leading edge at the best angle. A guide on the sharpener adjusts the depth of the disc on the leading edge of the tooth. Being able to work in a batch means that it doesn’t take long to sharpen all the chains. To use the sharpener, you simply turn the machine on, and pull the disc down onto the chain to sharpen every second tooth. All chains have a special link where two consecutive teeth fall the same way, and this is a good place to start and finish your sharpening cycle. After doing one side you rotate the base plate to the other side and sharpen all the opposing teeth. A guide holds the chain in the right place. The guide is adjustable for the wear on the chain, meaning even tired old chains can be sharpened. Does it work? Yes, to a point. I tend to do all the chains in batches and it does a reasonable job of sharpening the leading edge of the teeth. If you hold the disc down too long, it will burr and overheat the chain. As teeth wear, the leading edge recedes, and the guide also needs to be ground down to compensate. I haven’t been able to find a way to accurately shape the guide with this tool. Eye protection and hearing protection should also be worn. Do not do this on a day of Total Fire Ban as the grinding may and usually does cause sparks. 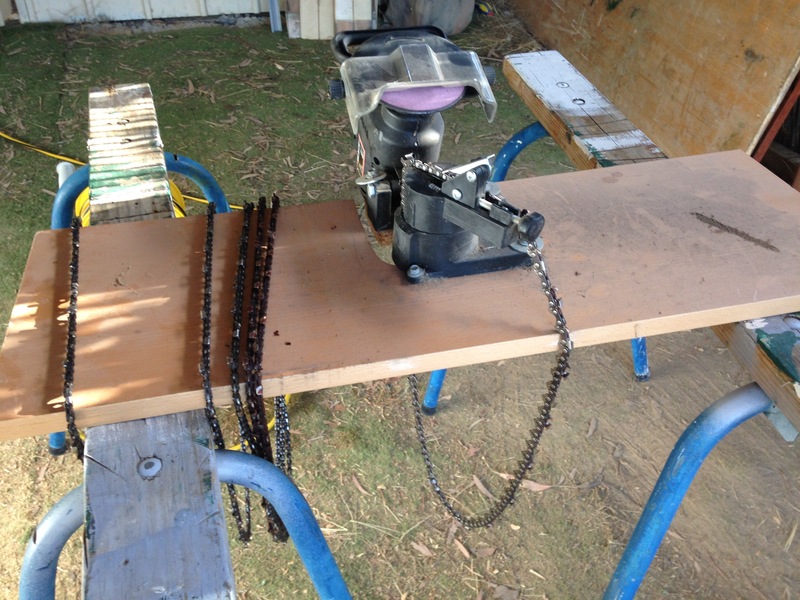 When my chains become too dull or out of adjustment, I send them to Gundaroo Machinery Service for a professional sharpen to bring them back to their proper parameters. Chainsaw sharpening is definitely a skill, and it takes years of practice to do it well. If you feel it something best left to the professionals, then I suggest you give people like Andrew at Gundaroo Machinery Service a call on 0414 824 176.